Consider yourself fortunate if you already own a California home. Very fortunate! 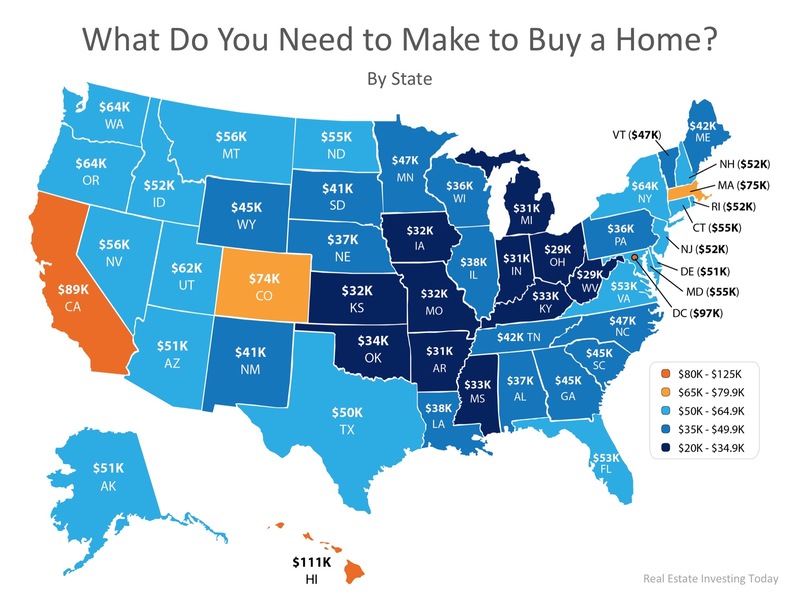 If you look at the map below, you’ll see that average Hawaii, Washington DC, and California home prices all command qualifying incomes of at least $80,000 to 120,000. That is the highest in the nation. So if you already own your San Diego home, consider yourself among the blessed. You are also equally blessed if you can qualify to buy a home in America’s Finest City (and county!). In our San Diego real estate practice, we always welcome clients coming down here from the San Francisco Bay area–or more rarely, Hawaii. Their homes are usually far more expensive than ours in San Diego–and they consider our North Coastal market to be a bargain. That’s one kind of California home buyer. Others are in for a jolt when they come from the Midwest, which offers some of the most affordable homes in the country. We must also educate these buyers about our lack of basements and usable attic space. Invariably, I’ll explain that we spend so much time out of doors year round, where we can entertain with ease. And because we lack that storage, we encourage Midwestern clients to pare down on belongings or be prepared to be using their garage for storing excess stuff, baggage treasures. It’s the cost we must pay for life in paradise. So, it’s no mystery that the American cost of living varies drastically depending on where you live. A relatively new study by GOBankingRatesset set out to discover what minimum salary you need in order to buy a median-priced home in each of the 50 states, including Washington, D.C.
As mentioned before, states in the Midwest came out on top as most affordable, requiring the smallest salaries in order to buy a median-priced home. States with large metropolitan areas saw a significant bump in the average salary needed to buy –especially in California, Washington, D.C., and Hawaii. These areas edged out all others with the highest salaries required. As we recently reported, research from Zillow shows that historically, Americans had spent 21% of their income on owning a median-priced home. The latest data from the fourth quarter of 2017 shows that the percentage of income needed today is only 15.7%–unless, that is, you want to by a California home!